For those looking for an online keno game with a difference, why not try live dealer keno? Live dealer keno brings all the action and suspense of playing keno in real life right to your computer, so you can enjoy the ambience of gambling at a high end casino without having to leave the house. This is a great option for those who miss watching the keno results unfold in real time at a land based keno venue but still want to enjoy all the benefits and convenience of playing keno online. What is live dealer keno? Live dealer keno is hosted by real human croupiers from sophisticated keno studios, using high-definition video cameras to stream all the action in real time via an Internet connection directly to your computer. A friendly host is on standby as players place their picks, with the winning numbers then drawn and announced right before your eyes, so there’s no need for the use of computerised random number generators (RNGs). The use of live hosts adds an extra fun factor and social element to the game while watching everything unfold live is a great alternative for those who are sceptical about RNG, computer-generated online keno games. The leading live dealer keno game is hosted by the innovative software development brand Ezugi. Ezugi’s live dealer keno is available at one of our favourite secure gambling sites, G’Day Casino, along with a range of other live dealer variants including live roulette, live baccarat, live lotto and live blackjack. G’Day Casino offers a safe, reputable place for Aussies to play live dealer keno, while also extending some awesome welcome offers to new players. Follow our links to register for an account with G’Day and receive an unlimited matched deposit bonus, 50 free spins on the popular South Park Reel Chaos pokies game along with a free carton of beer if your first deposit is over $100. To start with you’ll need a solid, reliable Internet connection to make sure you enjoy Ezugi’s live dealer keno at its best. This game is only available for desktop play, but as mobile technology advances we expect to see it optimised for smartphone and tablet accessibility in the near future. Scroll through the game catalogue on the left hand side of G’Day Casino’s home page, click the Live Casino category and from there select live keno. The game will load in a new browser so ensure you have pop-ups allowed for this site, otherwise you may need to configure this in your Internet settings. When the game loads you’ll either be asked to place your picks or if you’ve entered mid-game a countdown timer will come up advising how long to wait for the next game (never more than a couple of minutes). Place your wager and make your picks simply by clicking on the corresponding number on the game board (or click the ‘pick for me’ button for the computer to select your numbers at random) then sit back and wait for the good looking dealer to call the winning numbers. All wins will be automatically credited to your account and you’ll then be given the option to place an additional bet on the next round of live keno. A grid displaying the winning results of the previous game is displayed, which is helpful for those who employ keno strategies using frequently drawn numbers. 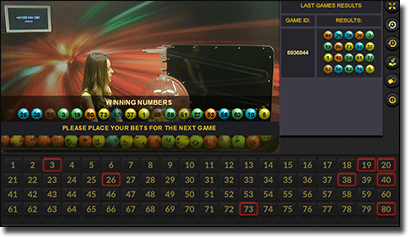 Ezugi’s interactive version of live dealer keno follows the standard rules of traditional keno, where wins occur as a result of players correctly predicting which numbers are going to be drawn. Just like traditional online keno, your chances of winning are purely based on the luck of the draw and there’s nothing that can be done to alter or persuade the results. Live dealer keno is played using a draw of 80 balls, numbered 1 through 80, with 20 balls drawn in each game to determine the winning numbers. You have the choice of selecting as little as one number or as many as eight. Wins are paid out differently depending on how many or how few numbers you bet on and you can view the odds for your selection in the top right hand side of the game layout. There’s live help on standby, so if you have any queries or any issues with your live dealer stream don’t fear as the support team will never leave you on the lurch. A live chat option is also available for players to converse with each other, which adds a fun social aspect to playing keno online. Ready to experience the excitement of live dealer keno? Head to G’Day Casino and sign up for an account today to play Ezugi’s awesome interactive game in real money using AUD.